One aspects of starting coaching again is that you realize how very time-consuming coaching really is: not only the travel to the track and the workout itself, but also writing training programs, go to competitions and training camps, communicate by app, etc. But let’s face it, nobody told me it was an easy or rewarding job, and after 30 years on the track you kind of should know how it is. But in 14 years of absence from coaching athletes on an almost daily basis, you notice changes. Fourteen years is almost a generation and with an ever increasing pace of change, those changes also seem to be amplified. Since I have been coaching elite athletes for a long time, the accumulated experience during that time makes it interesting to compare these athletes from the 1980’s and 90’s with the current generation of athletes that I coach. 1. this might be a coincidence but my current group of athletes makes me feel really dumb at times, all of them are extremely smart, thank God I still know a bit more than them about training and coaching. They are all very rational athletes and cognitively well equipped. Also they learn very fast, not only in cognitive sense, but also in the sense of motor leaning. 2. none of them are full professionals yet, they all have a fulltime study or work sometimes with adapted working hours. 3. their motivation and dedication are unbelievable, since I always thought that my former athletes were already very motivated and I found it hard to believe one could be more motivated than that. Wrong! They are extremely ambitious and have no problems raising the bar for themselves. 4. an obvious one: the use of modern technology is fully integrated in the lives of the athlete, not only the obvious use of their phones to communicate or to find information, but also the use of their phones for photos or video recordings . So I have much more visual data from training and competition than before, certainly since I came from the age of the Super 8 film camera. The limitation here is the overkill of data. I hardly have the time to watch all the movies and take splits or count strides. We predominantly use it for visual feedback for the athlete. 5. the new group is more independent and yes, like I wrote above, very smart, but like many of their generation, they sometimes tend to suffer from cognitive overload, also because the extremely high demands of their study and their work. However, there is an increased incidence of emotional turmoil. Their brains seems to be overstimulated and at times their hard disks are becoming full. Thus is however a normal social phenomenon. More than before, the guidance of the coach or better said: the psychological/emotional mentorship is much more important than before. The numbers show that many young people of this generation already suffer from burnout, which is a tell-tale sign about the unseen load like the iceberg hidden under the surface. Now all of this has no scientific value, but I don’t really care about that, my questions is if coaches who care coaching over a longer period as well share the same experiences that I observe , or maybe, like often, I am in an exceptional position. I am happy and proud to be lecturing on March 30 at the “Transfer to Sports” Seminar, together with my dear colleagues Justin Kavanagh, Jeff Moyer and Ian King, at The Sport & Speed Institute, Chantilly, VA. I will be speaking about advanced sprint training, and also about some new developments en experiences of the last year. 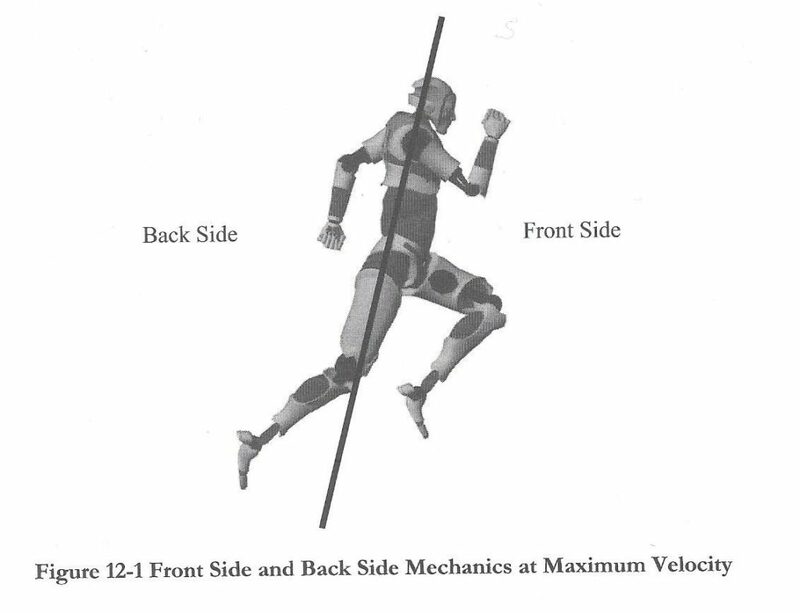 Front- side mechanics is the in itself plausible idea that the front-side of the running stride is important too, but in my opinion it is exaggerated in the sense that it is considered to be more important than back-side mechanics. The application of this concept can be seen in the development of exercises that focus on the front- side phase of sprinting. Of course this does not make sense at all. Simply because front-side and back-side mechanics are inseparable parts of the running stride, where a proper back-side mechanics prepares for a proper front- side mechanics and a proper front-side mechanics sets up for a proper back-side mechanics! Also, the relative proportion and importance of mechanics depend of the phase in the 100 meters, we can see different proportion in the start and acceleration phase and in the maximum speed phase. Often young coaches talk about “old school” training concepts, which is strange to me, not in the least because nobody is able to define old school nor new school. Is it the age of the coach? Nor does the word “old” or “new” say anything about the effectiveness of the concept. How would you rate the training of Usain Bolt? What would be the criteria to see a sprint training concept as being “old school” or “new school”. Is it divided purely along the lines of front-side vs. backside mechanics, like front-side = new school, back- side = old school? Is it based on the choice of exercise and drills? Is something new school because you use instability exercise, TRX and speed ladders, or do a lot of cross-fit with your athletes? Recently a pretty good research article appeared about the phenomenon of front-side mechanics, you’d better read it yourself, but let me surprise you with the summary of the result of this biomechanical research: “Overall, the present findings did not support that front-side mechanics were crucial for sprint performance among the investigated sprinters”. 1. the sprinter should apply more force on the ground…. so basically, the harder you pound the track, the faster you go? A higher vertical force is the result of sprinting faster, not the cause! 2. the shorter the contact-time, the faster you run…. in my opinion, the best way to create a shorter contact-time is to run faster, not the other way around! 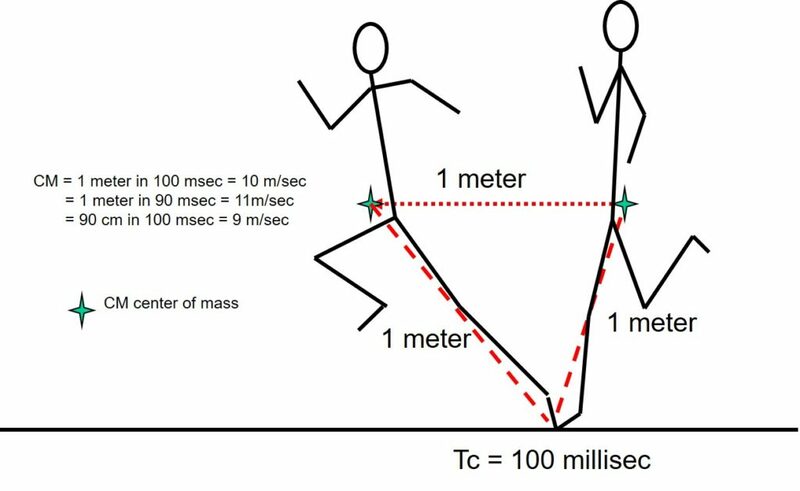 The contact-time is determined by how fast you run, or else how fast you are able to move your center of mass (e.g your hips) during the contact-time. Suppose your legs are 1.00 meter long and you move your center of mass more or less horizontally 1.00 meter while sprinting 10 meters per second. So you cover that 1 meter in a contact-time of 100 msecs, or 0.10 seconds, but when you run 11 meters per second, your contact-time will be 1.00 meter/11.0 = 91 msecs or 0.091 secs. In short: personally, I am a fan of the no-school approach, a mixture of old ideas that stood the test of time, and new concepts that are the result of increased knowledge, experience and technology. “Old” and “new” inadequate concepts to describe a sprint training concept. 2. Nett, T: Der Sprint, Bartels & Wernitz, 1974, pg.215-220. 3. Haugen, T; Danielsen, J; Alnes, L.O; McGhie, D; Sandbakk, O, Ettena, G: On the importance of “front-side mechanics” in athletics sprinting; Int. J. Sports Physiol Perform. Vol.13, No.4, April 1, 2018, pg. 420-427. Is there an “I” in team? 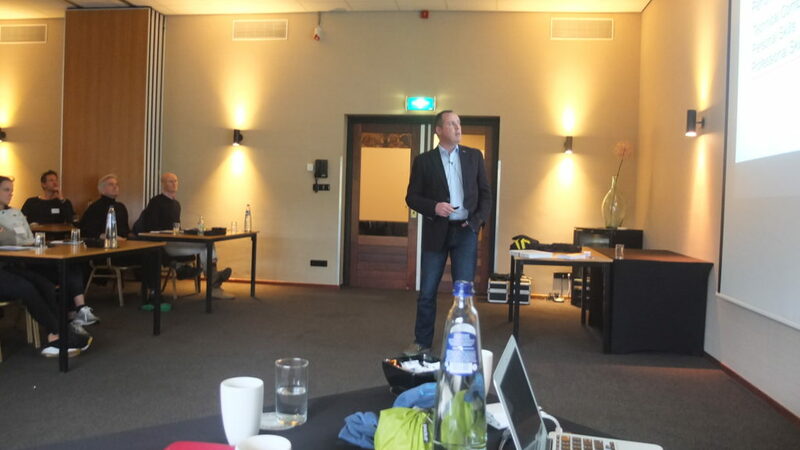 An often heard commonplace in the Netherlands, repeated like a thoughtless mantra, when talking to team coaches about the relationship between the role of the individual and the team: “there is no ”I” in team”……. If there wouldn’t be an “I” in team than there wouldn’t be a team in the first place or like Fergus Connolly said brilliantly when confronted with this popular statement: “No, but there is an “I” in winning……”. I have been writing about warming up a few times. I consider its purpose to be increasing body temperature and enzymatic activity, preparing the relevant physiological systems such as the autonomic nervous system for action. Most of the time, when preparing for explosive activities, one starts with slow jogging, followed by static stretching. Both are not adequate to prepare for explosive actions. So, for a change, preparing for a sharp relay training session, I decided to do something else as a warming up. Working with young women, and seeing them move, performing the dance-moves they see on the social media, they now had to perform their favorite moves for two minutes and the others were to follow. Then, after 2 minutes another athlete would take over. Result: warmed-up athletes after a 10 minutes of fun warming-up!!! Note: no, I did not participate, my dancing looks like a combination of John Cleese and Mr. Bean…. I have been writing about this phenomenon before. And the more I think about it, the more I see my statement is justified. Just one recent example – I can easily bore you to death with many more. This week in the magazine Runners: a new, useful supplement for sports: L-Carnitine, it is found in lamb meat and it helps the mitochondria to burn fats. Wow! ……only too bad that even as long ago as being an athlete myself, in the first half of the 1980’s, spending time in the national training camp for sprint in Formia, Italy, carnitine was already well-known and common supplement for athletes, produced by Sigma-Tau. In 1982 carnitine even made the headlines, since the Italian national soccer team became world champion “thanks to the use of carnitine”. So, what is now promoted as being “new”, “state-of-the-art” or “innovative” is basically knowledge or information that has been forgotten, overlooked, neglected, banned or ignored. Here we are, on the track, coaching an event e.g. 100 meter sprint, an athlete who wants to train, a date to perform e.g. the national championships…… now what? Which exercises is the athlete going to perform in order to run faster in competition in a month from now? This looks like an easy question, but the answer is much more complex. Some basic thoughts might help to sharpen our minds. What are the basic considerations here? we do this exercise because I have done this exercise myself (many coaches (often) have been average athletes themselves). I know this exercise, I know how it works and I know that it works (for me, at least). So basically this is the heritage of my own coach when I was his athlete. (“heritage approach”). we do this exercise because I have seen Usain Bolt and other elite sprinters doing this drill, so it must be good. In other words, if this exercise would not be good or harm, they would not perform this exercise or else they would not be running that fast. ( “copy-the elite approach”). we do this exercise because every sprinter in the world is doing this exercise. 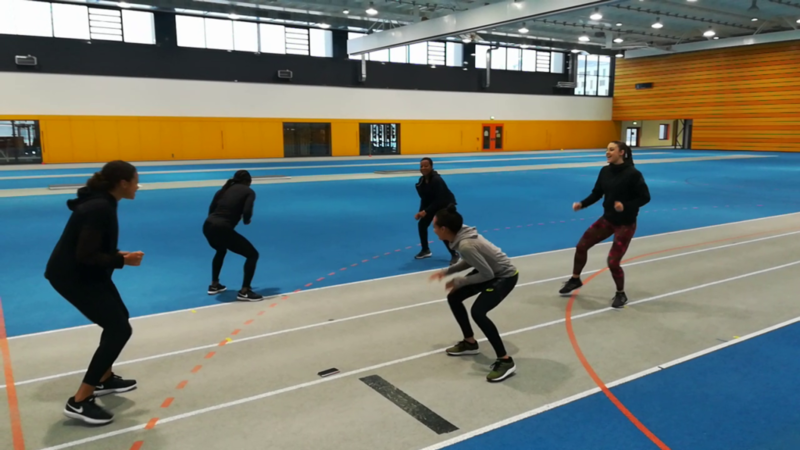 Go to watch any sprinter of any level train at any place in the world and you will see this exercise, so this exercise is an indispensable part of sprint training. Basically: everybody is doing it, so it must be good. (“indispensable approach” or “common sense approach“). we do this exercise because it was researched in a sport science article or review and it worked better than other exercise to improve speed. A scientific approach to training? 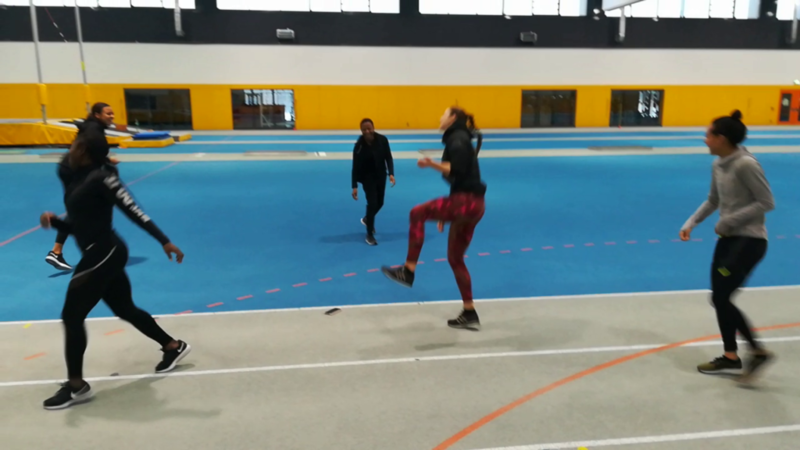 A research project with mediocre sprinters over 2 months is something else than our workouts over 10 years, being a national champion or an international elite athlete (“scientific approach”) . we do this exercise, because on the internet there was an article by a fitness guru who stated that this was the “king of sprint exercises”. He should know, shouldn’t he? After all he “worked with” hundreds of “elite sprinters” and he wouldn’t be the guru if he hadn’t done this (“follow-the-guru approach”). I bet that your approach is a combination of all approaches above, an eclectic cocktail of all these so called common sense approaches. But think about it: all of these approaches in the core neglect the unique demands of running 100 meter at top speed AND the unique qualities, strengths and weaknesses of your athlete. These exercises were often used other purposes and for other athletes. And sometimes in other events, e.g. bench press. My aim is to make us think about better ways to establish our choice of exercises and to create a more optimal training program for each and every individual athlete. No, it isn’t an easy task, but if someone ever told you this was an easy job, he/she has been lying to you. The Third Helping The Best To Get Better Seminar. Our third seminar was a great success. Interesting topics, great international speakers, a smart audience, and lots of networking during and after the seminar. What more can you ask for? 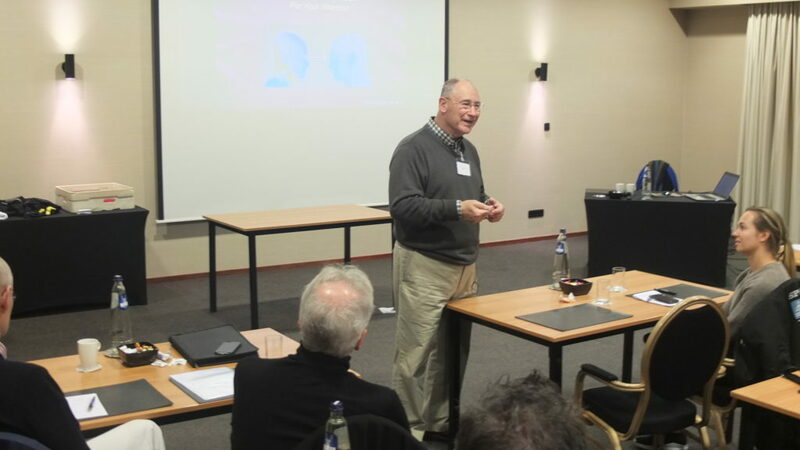 On Friday evening Dec.7 we organized a special Masterclass with Fergus “Gamechanger” Connolly in Eindhoven. 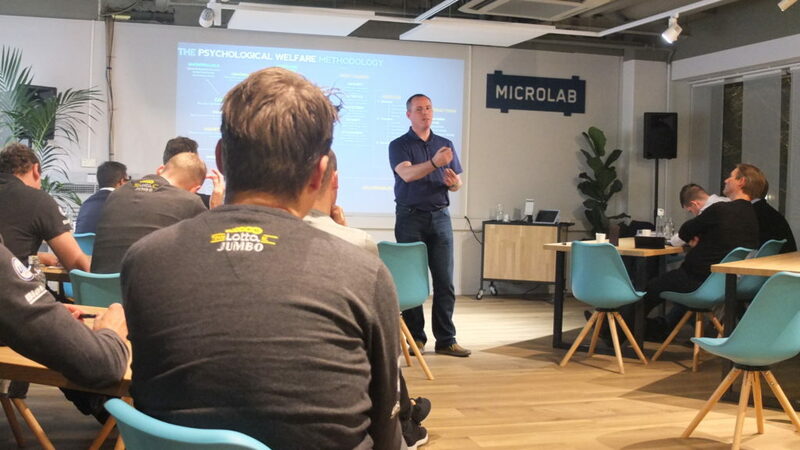 And on Dec.8 the seminar where Fergus spoke again about a different topic, we could have continued for some time since his book is full of topics, but one of his best qualities is his holistic view and the ability to oversee all of the performance-related factors. His new book, “59 Lessons” should be out by now, I can’t wait to read it. Performance Doc Gerrit Kieferstein spoke about Vitamine Sleep, and although I have been working on this topic since 1987 ( e.g.how to deal with jet-lag, in travelling to international competitions), also Gerrit placed sleep and sleep problems in to a wider context and gave us useful tips how to deal with it, beyond the usual sleep tips by so-called “sleep experts” in sports. Beautiful presentation that kept the audience focused until the last word. 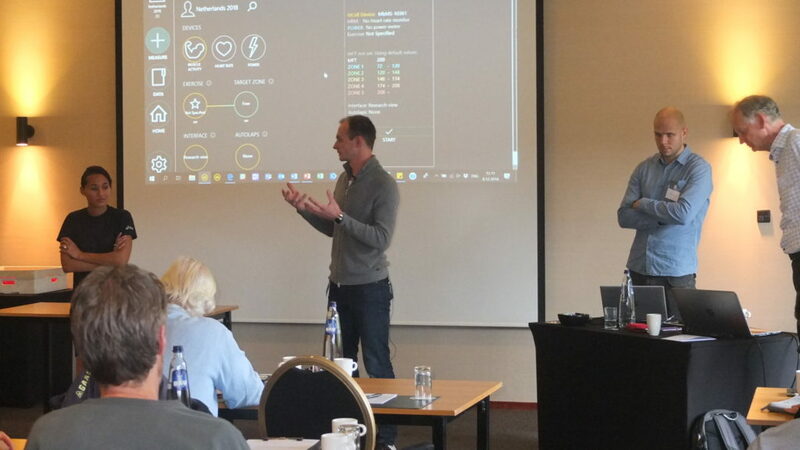 After that, my friend Kornelius Kraus demonstrated the practical applications of the EMG-short in real time. A week later he came to our training camp to test my athletes with his protocol as well. Bill Laich, like always a very solid lecturer, gave an great overview of the role of the visual system in sports and he complexity of this topic. 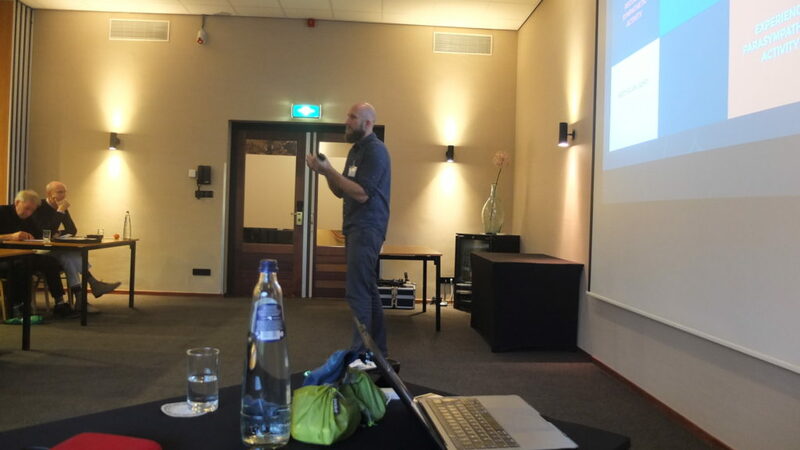 Myself, I gave a small overview of the use of EMG measurements in sports which e.g. 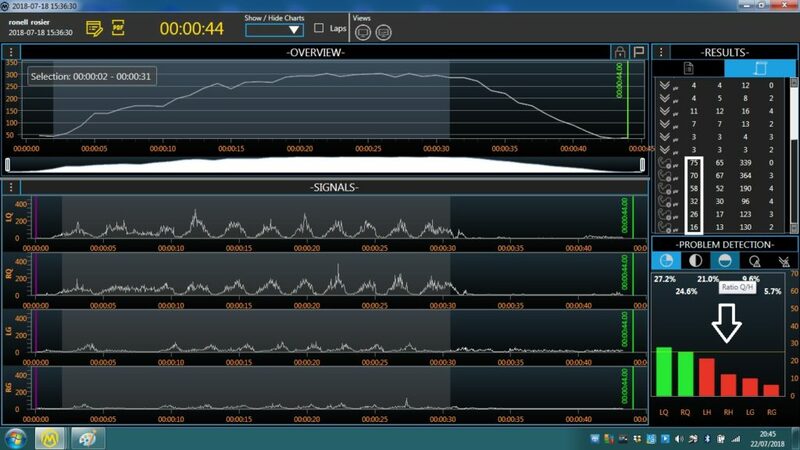 helps us to analyze the muscular demands of movement-patterns in competitions and develop exercise that are relevant and adequate to fulfill those demands. I showed the research that we have done this summer, to analyze the use of different muscle groups in sprinting, strength exercises, plyometrics, etc. The Masterclass as well as the seminar ran very smooth thanks to the invaluable work of Verena. We are already planning the fourth seminar in April of next year. Finally …. found the time for a new post. Absolutely right…….I have been slacking on my posts. The reason is, as you maybe guessed: lack of time. 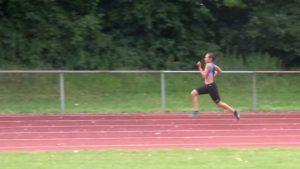 Since a few months I started coaching a young athlete again, so I spent time out on the track after 14 years, but, as things go sometimes, another athlete joined me and so I spent even more time on the track again. Also my (our) new book just finally found its way to the editor/publisher and while organizing our regular seminars, I decided to combine it with a Masterclass as well and then go to training camp abroad with my new athletes. More about this in the next posts. Being back on the track more frequently is time consuming, but great. It also pushes you back into the harsh reality of sport. Concepts, ideas, protocols are going to be tested in real life. Ideas that might sound promising, tools that seem to work miracles (at least on paper) or concepts that seem to make sense now face the hour of truth. Patience is a great asset, if you have it. If you don’t have it, find it or learn to get it, from somewhere. In Holland we don’t have accessible (and affordable) indoor facilities for training, I am not willing to pay $35 an hour. And just like when I was an athlete myself, 40 years ago, until recently, I had to climb fences and gates again in order to train on a track, the difference is that I now have to use a ladder. For my two new athletes I think in terms of 5-6 years, not about the competition next week or month. I am not in a hurry and time is on my side. We are not blinded by the fact that the next championship is in 10 weeks, I know I only have 8 or 9 weeks to do my job. It also helps to leave a lot of anxiety-driven-load out of my program, saving time, physical and mental resources, recovery time and reduces the risk of injuries. These athletes are also kind of “guinea-pigs” for my concepts of training. The goal is to make their training more efficient and effective, while reducing the risk of overload and injuries. Yes, indeed, you guessed it…….. train as much as necessary (to improve), not as much as possible. In the next posts in the coming days, I will share some of my experiences of the last two months. Yes, I was there when it happened, standing high up in the stadium in Seoul, next to Charlie Francis, when Ben Johnson won his 100 meter final in an unforgettable way. It’s probably the picture and the 100 meter race that everybody around at that time, still knows. But the more impressive, in a negative sense, was the news that Ben tested positive and had to be escorted to the airport. It felt like an earthquake happening. And the public opinion was clear about the “doping cheater”: from hero to zero in 9.79 seconds, from proud Canadian to dirty Jamaican. What a sinner he was. Even at the time of the Dubin Inquiry most people thought he was the only sprinter in that race who took drugs to enhance his performance. But as the years went by, a different picture evolved, the situation wasn’t as clear cut and clean as many people thought. First of all from the very start, there was the steady denial of Charlie and Ben of Ben having taken steroids in the time before that race. And there were other strange things happening, one of them was that one of the lab assistants had leaked the story. Another one was the presence of a friend of Carl Lewis, Andre Jackson, not an athlete, doctor or team manager, turning up at Ben’s doping test. A story that is well-known but his exact role never became clear. In the meanwhile it also became clear that other athletes in that race probably weren’t as clean as they maybe should have been. Linford Christie already tested positive on ephedrine, but got away with that, the suggestion it was in the ginseng tea in the Olympic village. Strange, since for sure, he had not been the only athlete drinking that tea and got tested. But nobody else tested positive on ephedrine. Ben always insisted that test in Seoul was spiked or fabricated. Now last week, the real testing results of that test appeared in the press. And guess what…. it shows at least that the test results were tinkered with in a totally unacceptable way. The original computerized finding of oxandrolone, a completely different molecular structure from stanozolol, was scratched out and replaced by a handwritten: stanozolol. On top of that, Ben’s lab code on the report was change by handwriting. Another question to as is why the officials kept this report a well-guarded secret form 30 years, if nothing was wrong? Now you might think this is an exceptional case, but it turns out not to be. In the days before the Seoul Olympic Belgian marathon runner Ria van Landeghem tested positive on ……. Oxandrolon and was stopped from competing at the Olympics in Seoul. Just three years ago, also she had her test results reviewed by lab technicians, who have worked at accredited doping labs. They clearly stated that this finding was wrong! A recent case is the case of Alex Schwazer, the Italian Race walker and Olympic champion on the 50 km in 2008. He again seemed to have tested positive on testosterone after a 3.5 year ban. He also stated that his test has been tinkered with. True or not, the latest Russian doping lab scandal had without a doubt shown that the whole doping testing procedure is a dirty as some athletes are and subject to manipulation for political or financial gains, for disliking or punishing a certain athlete, or for protecting the goose that lays the golden eggs. 1. the whole story about Ben Johnson stinks like a rotten egg. 2. if you trust the doping tests, the procedures, or the testers and their real intentions, you are or incredibly naïve and brainwashed by the fairy-tales of the anti-doping mafia, or you are plain stupid. Holiday time, so finally a few days off from my daily work and work in the high-performance business. Therefore this time a post beyond the world of sport and performance, about some things that make me wonder sometimes. I will start this post with a strange story, not true, but you will get what this is about. Suppose you are my age and you are walking down the street, all of sudden you don’t feel that well, your breathing becomes difficult, you feel pressure in your chest, and you know: this is my heart and you remember: if you are in the hospital within 6 minutes, you have a good chance to survive and recover. Now you left your mobile phone at home and ask a person who walked past you, since there is nobody else around “please can I use your phone to call 911?” Now that person tells you: sure, if you pay me 50.000 dollars cash now, you can get my phone or I can dial 911”. Obviously you don’t have that much money in your pocket, so the person says: “well, too bad, but realize this is very expensive phone and the research necessary to make it work costed billions, besides that, if your life isn’t worth 50.000 dollars well, that’s bad news for you”. So what do you think about this situation? I ask this because the same thing is happening here in Holland right now. There is a medication for people who suffer from rare metabolic genetic and terrible disease called CTX. The producer of this medication, Leadiant sells this for 180.000 to 240.000 dollars per patient per year, since not many people can afford this price to save their lives, other people who do have a heart, working at the Academic Medical Center in Amsterdam, decided they could manufacture that medication themselves in their hospital pharmacy for around 23.000 dollars. They had the substance produced for purity and tested and everything was OK.
Now Leadiant did not like this handsome profit going down the drain and got in touch with the government, they probably sent in some lawyers and lobbyists, filled some bank accounts and guess what: the AMC has to stop producing it, since all of a sudden it could not be proven that the substance was pure. That is how our government seems to work nowadays. Not to mention that the same impurities were found in Leadiants own product! Looking this up at the Internet you will find that the real price for the substance is 200 dollars for 1 kg of it, approximately good for a 3 years supply. In short, Leadiant is willing to kill patients for a profit of in average 220.000 dollars a year. Yes, my friends, disease has become a commodity and a handsomely profitable one as well. All of this makes me wonder what kind of people work at Leadiant? How can they look into the mirror every morning, knowing that they willing to let people get sick or die for an unexplainable and unreasonable profit? Sometimes killers don’t carry a gun, but they are armed with pen and paper, wear a nice suit and tie, drive a BMW. That governments are not always on the side of its people but more on the side of the pharmaceutical industry and criminals was never expressed more clearly than in the Nuremburg Tribunal Case IV. After the well-known Nuremberg tribunal case against the German Nazis chiefs took place, Case IV was staged against only the heads of the chemical and pharmaceutical industries united in I.G.Farben, which supported the work done in concentration camps, use slaves as labor forces or delivered the chemicals for the terrible experiments done on the prisoners there. Times might change, but the these people do not, even if marketing and lawyers might give these crimes a more friendly face. In the past many young athletes came to me and told me they had become vegetarians overnight. Great! But my first question was why? They often came up with the same reason. They had compassion with the suffering of the animals that were killed in order to end up on their plate. Since according to them, animals obviously have a consciousness, have a sensory system, are intelligent, can communicate, and feel pain, were some of the arguments. Fair enough. “So what do you eat now”, would be my next question. “Well, plants of course, more vegetables, fruits, herbs, legumes, grains, etc.” My last questions never failed to produce a puzzled look on their faces. “Are you 100% sure that plants have no consciousness, don’t have a sensory system, are not intelligent, cannot communicate or do not feel pain?”. I seldom heard an answer, but at least it made them think. Just in case you are a vegetarian yourself, here are some facts about the plants that you might not know. 3. Humans have 5 or 6 senses, plants something like 16 senses. 4. Plants do communicate, even if we don’t understand their language and as matter of fact they are able to communicate in various ways. In case of an attack by herbivores or insects, since they cannot run away, they scream for help in various ways and even alert their neighbors for potential danger, while also signaling for help from their enemy’s enemies. They are also able to recognize their kin. 5. Plants may possess a memory system. 6. Plants are geniuses in the art of chemical warfare, against larger herbivores, insects or different species or plants. They have been experimenting for millions of years. Recent research shows that plants are living and sophisticated creatures, probably worth more of our attention and sense of wonder. So next time you peel a potato, put your fork into a salad, cut a flower or cut the grass, keep this in mind. Trewavas, A: Plant Behaviour and Intelligence; Oxford University Pres , 2014. Trewavas, A: Intelligence, Cognition, and Language of Green Plants, Front. Psychol. 7:588. Chalker-Scott, L: How plants work: the science behind the amazing things plants do; Timber Press, 2015. Mancuso, S; Viola, A: Brilliant Green. The surprising history and science of plant intelligence; Island Press, 2015. Blande, J.D. Glinwood, R: Deciphering Chemical Language of Plant Communication; Springer, 2016. Karpinski, S; Szechynska-Hebda, M: Secret life of plants. From memory to intelligence; Plant Signaling & Behavior 5:11, 1391-1394; November 2010. Wohlleben, P: The Hidden Life of Trees: What They Feel, How They Communicate. Discoveries from a Secret World; Greystone Books. King, J: Reaching for the Sun; How Plants Work; Cambridge University Press, 2011. Bais, H.P; Park, S.W; Weir,T.L; Callaway, R.M; and Vivanco, J.M: How plants communicate using the underground information superhighway. Trends in Plant Science Vol.9 No.1 January 2004. Gagliano, M; Renton, M; Duvdevani, N; Timmins, M, Mancuso, S: Out of Sight but Not out of Mind: Alternative Means of Communication in Plants; PLoS ONE 7(5): e37382. Chamowitz, D: What a plant knows : a field guide to the senses; Farrar, Strauss and Giroux, 2012. Mancuso, S; Viola, A; Brilliant Green – The Surprising History and Science of Plant Intelligence; Island Press, 2015. Heil, M; Harban , R: Explaining evolution of plant communication by airborne signals; Trends in Ecology and Evolution Vol.25 No.3, 2010. Koller, D: The restless plant; Harvard University Press; 2011. Witzany, G: Balusek, F: Biocommunication of Plants, Springer, 2012. A few weeks ago the Dutch sports community seemed to wake up from a coma: Dutch speed skaters, you know, the ones that won all the medal at the Olympics, seem to have used thyroid hormones. Wow, what a surprise. American track and field athletes knew for years, already since the nineteen eighties, the effects of thyroid hormone on performance, that is why e.g. they visited Dr. Brown who diagnosed them with subclinical thyroid deficiency and look… great performances. Or did you really think that the Dutch speed skaters did so well on potatoes, bread and cheese only? Well, the Dutch sports community did and still does: “it’s not on the banned list, so it is not ergogenic”, “there is no scientific proof it improves performance” (really?) And of course, doctors in a knee jerk reflex immediately come up with the good old scare tactics for banned substances….. “it is dangerous for your health …..” (really?). It’s the human weakness, like the human eye only looks outside, never inside, in every country the majority of people believe their own athletes are clean, whereas the rest of the world is juiced to the brim, that is why they are better. And if we are better it is because of special genes, good training , we have the best coaches, and a perfect elite sports environment that makes our superiority possible…. We have a good laugh about so much ignorance isn’t it? Don’t just assume or copy: measure! I love research, scientific research, or better yet, sport scientific research, but I try to not become blindsided by it. We have to realize that research has a completely different goal from coaching. It is a different process altogether, and always targeted towards generalizable results and guidelines for the average person. But in elite sports there is no average person, we are working with a small population of genetic freaks, outliers, from the range of average. In elite sports small differences between individuals can make a tremendous difference in performance and create the difference between an Olympic champion and not making the finals. We are looking for marginal gains, below the level of statistical significance. So I don’t really care about the average result of a scientific research project in sport, often conducted with average athletes. The consequence is that I have to take a close look at each individual that I am coaching and try figure things out. Profiling an athlete is an important part of my concept of training and coaching. 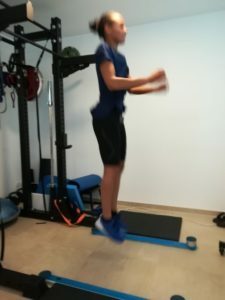 A few weeks ago, together with a very smart young sport scientist and coach, Dr. Kornelius Kraus from Muenich, we decided to conduct a small case-study with one athlete only as a kind of possible blueprint. We looked for a few aspects here. Be aware that this is not something you have to do with you with your athletes, it is a summary of some things that we did, since we thought this was important for us to know about this particular athlete. So don’t copy, just read, try to understand the underlying principles and adapt to your own and your athlete’s needs and specific environment. 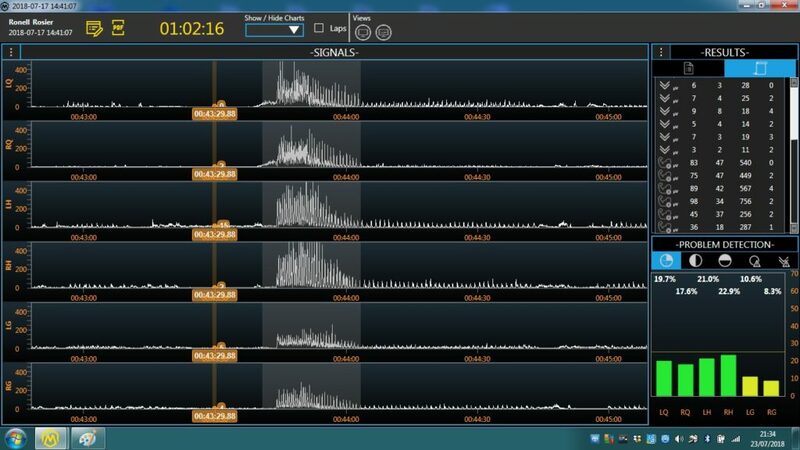 We measured muscular activity by measuring EMG of L and R quads, L and R hamstrings, and L and R glutes and stored and processes these data: QL/QR, HL/HR, GL/GR. From the EMG we derived the average as well as the peak EMG during a defined duration. I won’t bore you with the results more than 30 exercises and drills that we tested, but chose a few examples only. The subject is a young athlete, who recently started training for sprint. 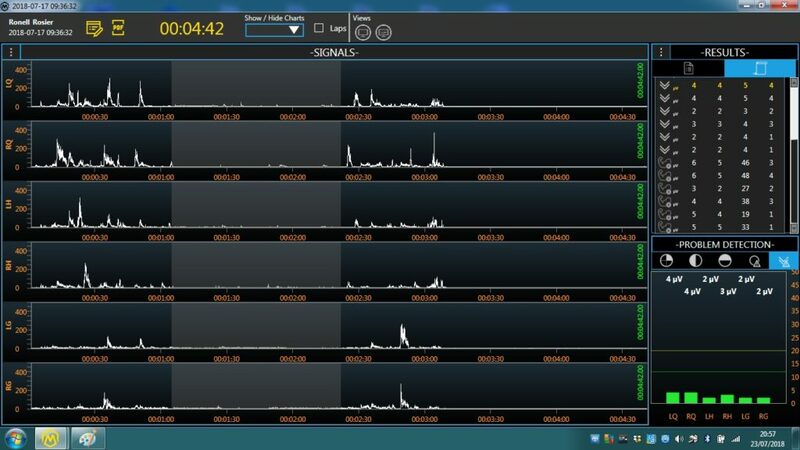 The grey zone is the processed duration of the EMG measurement. 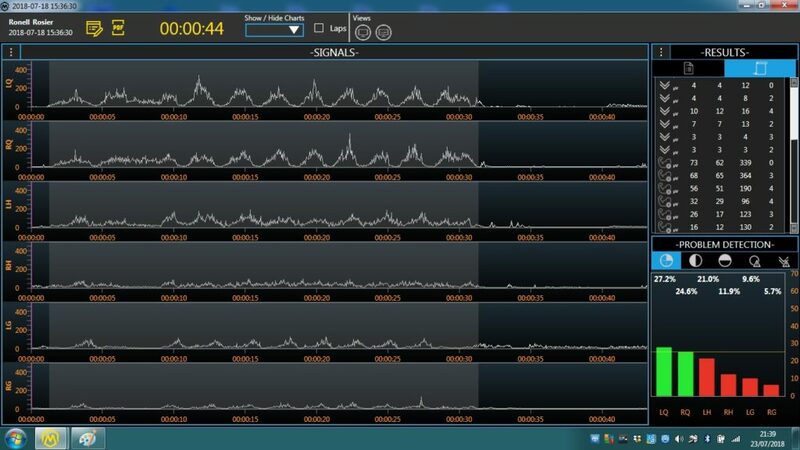 The green light down right indicate there are no L/R imbalances in rest and the EMG activity is low (< 6 microvolt). We see a nice L/R balance in the quads and hamstring, but an imbalance and low activity in the glutes. For the first time this athlete lifted weights and performed 10 hex squats with 30 kgs (67 lbs). We see an increased activity of quads, hamstrings and glutes, with the L hamstring and L glute becoming dominant, a higher EMG activity than the R hamstring and R glute. The last exercise is 50 meter sprinting from standing start (30 meter acceleration + 20 m flying). A somewhat higher overall muscular activity, still to be expected, but a reversal of dominance: now the hamstrings activity is higher than the quadriceps activity. In the sprint of this athlete we see a higher activity of hamstrings and glutes at the expense of the quadriceps activity. A summary in numbers you find in the graph below. The real issue however, is not the measurement itself, but the interpretation of the numbers! So what does it mean if e.g. 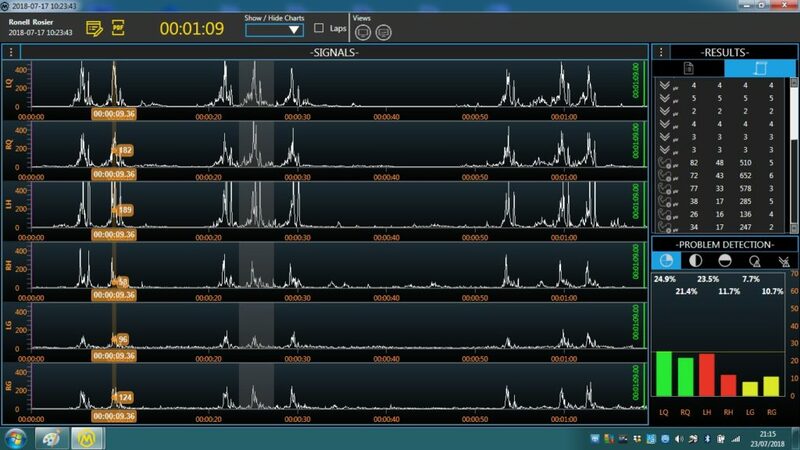 in the 30 kg squat the left quad shows an activity of 82 and the right quad of 72 mV? How is this related to strength? One could state that the left quad is stronger based on the recruitment of more muscle fibers, which means the right quad is weaker and needs to be focused on. Or is the left quad weaker, and that is why it has to recruit more muscle fibers as a compensation? Or is it just something else, a leg length difference, a pelvic imbalance or tilt, or just a matter of not having stabilized the movement pattern because this is the first time? This is rather simple to find out, we make a force-velocity curve in leg extension (or better: knee extension) equipment, to have a better look at the cause of this imbalance and to see with quad is stronger, but that is something for a next post. So what could we learn from these tests? 1. The balance between e.g. quadriceps and hamstrings changes as the movement velocity and the load change. This is important since many of us detect a muscular imbalance by testing one movement of exercise only. This will not tell you the whole story and often only will give you inadequate information, leading to inadequate interventions! 2. The same thing applies to L/R imbalances.